Joe Biden is attempting to deal with his "personal space" problem. 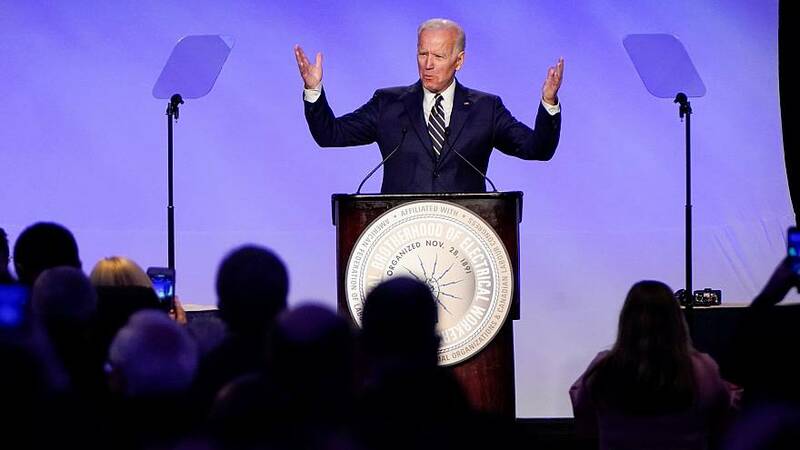 At a speech to the International Brotherhood of Electrical Workers' conference in Washington, D.C., Biden opened his remarks by joking that he'd received permission to hug the group's president, Lonnie Stephenson, whom Biden had embraced after being introduced by him. "I just want you to know, I had permission to hug Lonnie," said Biden, who is said to be gearing up for a presidential run. "By the way, he gave me permission to touch him," the former vice president said. Biden's speech Friday was his first public appearancesince allegations emerged from several women who say he made them uncomfortable. Last week, Lucy Flores, a former Democratic nominee for Nevada lieutenant governor, said Biden made her feel uncomfortable by smelling her hair and kissing her head at a 2014 campaign rally. In addition, six other women have come forward with their own allegations of encounters with Biden that they said made them feel the same way. On Wednesday, Biden had posted to Twitter a two-minute video in which he said "social norms are changing," and that what he viewed as "gestures of support and encouragement that I've made to women and some men" have sometimes made them uncomfortable. "I get it, I get it. I hear what they're saying. I understand it. And I will be much more mindful. That's my responsibility," he said.